Black Stallion Estate Winery is owned by the Indelicato family, with a grape growing and winemaking history that has spanned three generations and more than 90 years. The name of the vineyard is an homage to Gaspare Indelicato, who came to America more than a century ago to continue his family’s winemaking heritage in California. He passed along this dedication to hard work and pursuit of excellence to his family, and his legacy is expressed upon the release of every vintage. From childhood chores on his family's vineyard in Germany to crafting small lot wines in Napa Valley, Ralf has an eclectic mix of winemaking experience that spans two continents. 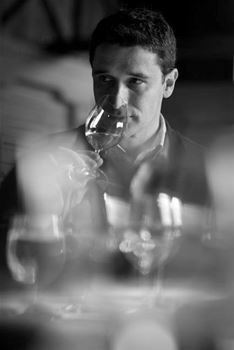 He studied winemaking and viticulture at Germany's prestigious University of Geisenheim and worked at several wineries in Reinhessen and Nahe, before studying fermentation science, viticulture and enology at the University of California at Davis. Ralf became fascinated with California's wine culture and has since relished the New World approach to crafting wine. Ralf has received thirty 90+ Point scores from Wine Advocate and Wine Spectator on his wines. Winemaking starts in the vineyard. Location, climate, picking decisions - these are all crucially important factors that will ultimately determine the quality of your finished wine. At Black Stallion Estate Winery, I am so fortunate to have the opportunity to personally hand-select our fruit from some of the finest vineyards and AVA's in Napa Valley.